D-Link is launching a few IP cameras and a couple of Wi-Fi home networking solutions at CES 2017. More relevant to our recent coverage are the two new whole-home Wi-Fi solutions being launched under the Covr tag. Mesh Wi-Fi's sudden market traction, thanks to offerings from startups such as eero and Luma, has forced incumbent vendors to re-package their separate router and range extender product lines with tighter integration in terms of both hardware design and firmware features. Qulacomm's Wi-Fi SON (Self-Organizing Networks) firmware features have definitely lent a helping hand to vendors to get started quickly with such systems. D-Link's Covr systems come in two flavors - one with a pure Wi-Fi backhaul, and the other with a powerline backhaul using HomePlug AV2 technology. The firmware features for the whole-home Wi-Fi system are based upon Qualcomm's Wi-Fi SON in both versions. We have already evaluated different types of backhauls for extending Wi-Fi reach. In our testing, a dedicated 4x4 802.11ac Wi-Fi backhaul was able to perform better than both HomePlug AV2 (AV2 2000) and G.hn powerline systems. However, performance seen by end users may vary widely based on the type of construction of the home as well as the Wi-Fi backhaul characteristics and powerline chipsets used. The pure Wi-Fi backhaul version is the Covr Wi-Fi System (DKT-883), while the HomePlug backhaul version is the Covr Powerline Wi-Fi System (DHP-W732AV). Typical mesh Wi-Fi or whole-home Wi-Fi systems rely upon multiple units sharing very similar hardware. On the other hand, D-Link has adopted the more traditional approach with an AC2600 router (based on the Qualcomm Atheros 8065 SoC) - the DIR-883 Dual-Band MU-MIMO Wi-Fi Router with 4x4 802.11ac (1733 Mbps in the single 5 GHz band and 800 Mbps in the single 2.4 GHz band) - at the heart of the system. The DAP-1655 AC1300 Gigabit Wi-Fi Extender (2x2 802.11ac with 867 Mbps in the 5 GHz band and 400 Mbps in the 2.4 GHz band) is the other part of the system. 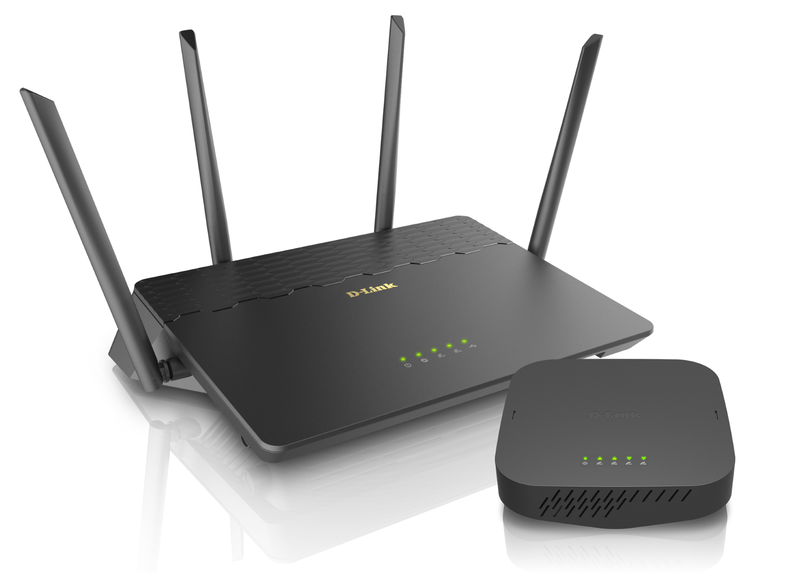 Note that there is no dedicated Wi-Fi backhaul channel - bandwidth is shared between client devices and the router-extender communication link. Users sensitive to performance need to keep this mind. The selling point, therefore, boils down to the Wi-Fi SON features of smart steering, load balancing across the 5 GHz and 2.4 GHz bands, and easy set up. Each kit member also has three gigabit ports to service wired clients at their placement locations. Note that the kit doesn't need a wired connection to the main router (typical of many range extenders that use PLC backbone). Instead, since both members of the kit are Wi-Fi-enabled, one is used to connect to the Wi-Fi network of the main router, while the second one can be connected to any power outlet to extend the Wi-Fi reach. The key here is again the use of Wi-Fi SON to make the whole experience seamless when handing off clients between the Wi-Fi networks of the PLC kits and the main router's Wi-Fi network. The DKT-883 and DHP-W732AV will both become available in Q2 2017 for $300 and $199 respectively. In other CES news, D-Link also launched their first Apple HomeKit-certified IP camera, the Omna 1080 Cam HD (DSH-C310), and a host of other budget IP cameras. A welcome announcement was the integration of the functionalities present in multiple D-Link apps into one unified mydlink Home App for all of the company's IP cameras and smart home devices. Unless it has changed in the last 12 or so months since I looked, the requirement that you have to run java on a client to manage them for starters. Also some significant vulnerabilities, though I'll grant most of the other manufacturers of consume routers have tons as well.